If you’re lacking a good reason to love France today, here’s a fine one: the Bescherelle has been on the Amazon France bestseller list for 324 days. It’s currently the 19th highest-sales item, and that’s down from its previous listing. The written French verb is a marvelous thing, with inflections for person, number, tense, aspect, mood, and occasionally gender (e.g. adjectival past participles of verbs conjugated with être). This works out to maybe 50 forms for every verb, with lots of irregularities that you just have to memorize. 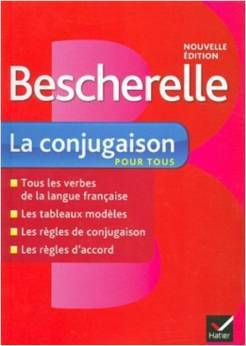 The most popular reference is Bescherelle: La conjugaison pour tous (“Conjugation for everyone”). Named after a 19th-century French lexicographer and grammarian, Bescherelle is actually a series of books on conjugation, grammar, and orthography (spelling), and it is so popular that the word Bescherelle is used in the modern language to refer to any guide to conjugation (or so Wikipedia tells me—I haven’t heard this usage). When in France I work as a visiting researcher in the Groupe Information, Langue Ecrite et Signée (ILES). I thought it would be nice if I could read my own group’s web page, so I opened up a dictionary and headed on over. Perusing the page, I saw what must be the best French word ever: retweeté, “re-Tweeted.” Note that I have no idea whatsoever how to pronounce it. So, what else would one need to know in order to be able to read the ILES web page? précis(e): accurate, precise, exact, specific. Can also be a book, in which case it’s a handbook, manual, or summary. la candidature: application. In politics, it’s candidacy. An email about a plan to apply to host a conference started with this sentence (how like Zipf’s Law to strike in the very first sentence): Nous continuons à préparer une candidature pour la conférence JEP-TALN 2016. Only two words ’cause I only have two French emails in my Inbox! rodaja: a round slice; also a disk or a caster. There’s an excellent Guatemalan restaurant in town called Tres Tiempos. I spent an evening there eating tamalitos and a sort of Guatemalan hotdog and looking up the words on the menu. How could repollo possibly not mean “chicken”?? repollo: cabbage. You probably learned the word col—so did I. Don’t know where this one comes from. Incidentally, if you’re into language and you’re into food, you will want to check out Dan Jurafsky’s latest book, The Language Of Food: A Linguist Reads The Menu. Dan received a MacArthur Genius Grant for his fascinating work in natural language processing, and his talk on ketchup at a NAACL meeting is probably most people’s favorite keynote speech ever. If you start out at smile.amazon.com, you can donate part of the purchase price to Surgicorps. The first day of a Surgicorps visit to Guatemala is taken up with screening all of the people who show up hoping for surgery for their children or themselves. The surgeons and anesthesiologists are quite heroic, and will see everyone who shows up. (People also trickle in through the back door all week—I haven’t seen the surgeons refuse to examine anyone, regardless of whether or not they come on the mass screening day.) Some people are there from early in the morning until deep into the evening, waiting in line with their little children, or elderly mother, or just themselves, undoubtedly hungry and anxious about the outcome of the screening. Similarly, the physicians mostly skip lunch and work until everyone has been seen. It all makes for an intense day, and for the interpreters, it’s the busiest day by far, as well as the most unpredictable one in terms of what you’ll need to interpret about. espina: thorn. This came up in the context of a patient explaining that he had embedded a thorn deep into his hand. It also turns out to mean “spine,” in the anatomical sense. So much for the “one context, one meaning” hypothesis. claw: so, this is a really tough one. There are four (four) nouns that translate the English noun claw, and three of them have come up so far this week. Pinza is a claw like a crab or lobster claw. This one came up in the context of “claw deformity”—we saw a couple of patients with claw deformities of the hand (see photo, from Tumblr). Garra is a claw like an eagle’s claw or a lion’s claw. 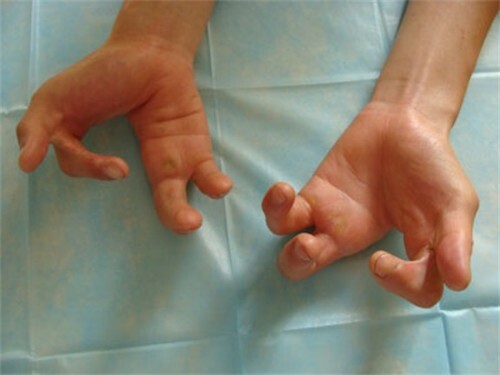 This one came up in the context of giving instructions for a hand therapy exercise. Finally, there’s another word, zarpa, that I haven’t figured out how to use yet. So much for the “one context, one meaning” hypothesis, once again! Note that the previous example was ambiguous in the direction of Spanish to English, while this one is ambiguous in the direction of English to Spanish. trompa: in the context of anatomy, a duct or tube. Trompa de Falopio: Fallopian tube. hormigoso: ant-like; full of ants; ant-eaten; or, in this context, itchy. If you’ve read this far: how about a donation to Surgicorps? It’s a wonderful group that does great work. To a linguist, the term dialect generally refers to a form of language that is associated with a particular geographic area. Although the terminology varies from linguist to linguist, we have other words for varieties of language associated with particular social groups (sociolect), people who share very specific activities (jargon), levels of formality and specific social contexts (register), and so on. How you will speak at any given time is an interaction between the tendencies of your dialect, sociolect, the register, and so on. Back to dialect: there is a cognate term in Spanish, but the denotation is quite different. In Spanish, dialecto typically refers to an indigenous language. As one of our surgeons, a native speaker of Spanish, put it the other day, referring to a patient in the recovery room: “even though I speak Spanish, I don’t understand him, because he speaks a dialect.” This was a patient who spoke one of the indigenous languages of Guatemala. Most of these languages belong to the Mayan language family. There are about 29 Mayan languages, of which 21 are spoken in Guatemala by the large indigenous population—about 70% of Guatemalans are native. (The rest are called Ladinos.) The Mayan languages are about as similar to or different from each other as English and German or Spanish and French. Patients who speak one of these languages and don’t also speak Spanish must bring someone who can interpret between their language and Spanish, and then one of the Surgicorps interpreters interprets between Spanish and English. I’ve seen four patients like that so far in the past three days. This leads to the question: if the Spanish word dialecto means an indigenous language, how do you say “dialect” in Spanish? I don’t know the answer. The Spanish Wikipedia page for dialecto discusses it as a technical term in linguistics, with the same basic meaning as the English sense. (Note that as is the case in English, there is sometimes a large difference between the technical meaning of a term and the meaning of that term in the general language.) There is a Spanish term jerga that translates roughly as “jargon.” The Spanish Wikipedia page for jerga distinguishes it from “dialect” in that a jerga is associated with a social group or a profession, and is used either to obscure communication with out-group members (slang) or to enhance communication on technical subjects (jargon). The search continues.